Wharton Global Family Alliance (Wharton GFA) – The Wharton Global Family Alliance is a Wharton initiative that centers on a broad set of issues faced by global families that control substantial enterprises and resources. The Wharton GFA is globally recognized as the leading institution for the creation and dissemination of knowledge and practices of multi-generational families and their businesses; The Wharton GFA seeks to foster the longevity, harmony, and prosperity of multi-generational, multi-branch families and their businesses. 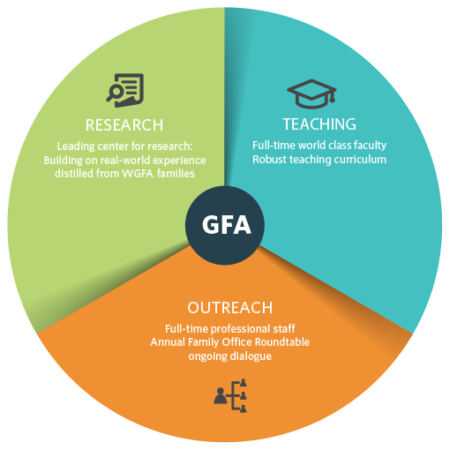 The Wharton GFA transcends boundaries to enable collaboration and effective communication between researchers and families for mutual benefit and for the benefit of society at large; it enables thought leadership, knowledge transfer, and sharing of ideas and best practices among influential families; it publishes in a range of leading academic and practitioners’ outlets cutting edge theoretical, empirical, and field research on key issues affecting families and their businesses; and it initiates, manages, and participates in global forums and conferences.